Upon entering Résidence Lumière, you will immediately notice the abundance of light and comfort inside the building. This is no accident. While retaining the authentic look and charm of the old building from the street side, all existing windows to the courtyard have been widened and new French and regular balconies with full glass doors have been added. Several dozen new panoramic windows will be installed in the roof and newly constructed upper floor. Lighting plays a pivotal role in modern, comfortable living spaces so everything has been done to ensure Résidence Lumière provides a sunny, warm home where residents can enjoy an exclusive standard of living. 11 Rupniecibas Street was carefully performed in order to retain the historical qualities of the building while introducing modern technologies. In the evening, the building’s unique facade now stands out thanks to an elaborate lighting system that illuminates its individual architectural elements: arches, bay windows and balconies. The traditional grand decorated staircase with its glass dome was complemented by a panoramic lift with paintings. While the design of the doors and windows was preserved, they were made easier to use. The original parquet of the staircase was restored to its former glory; regaining its shine and durability. In the creation of Résidence Lumière, the former grandeur of this Jugendstil building was preserved; retaining its unique historical features while introducing modern technologies to ensure a more comfortable and aesthetically pleasing environment for its residents. Résidence Lumière was created with your comfort in mind. Therefore, its apartments come with their own exquisite design. 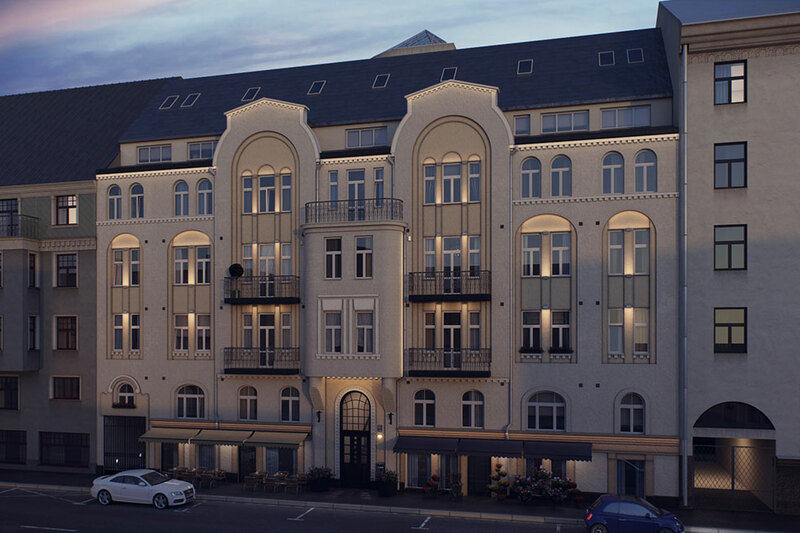 Latvia’s best specialists developed several interior design options especially for these apartments – ranging from romantic Jugendstil to contemporary high tech. Great attention has been paid to each and every detail, including: floor coverings for individual rooms, the finishing of walls and ceilings, doors, light switches and fixings. All you have to do is choose which style is right for you. Light-coloured parquet, wall coverings streaked with silver, and an abundance of white. The neat lines of the ultra-modern furniture, glass and chrome fit seamlessly into this design. Do you favour laconism and stylish functionality? If so, this option will suit you perfectly. of antique refinement. The cappuccino-coloured parquet of the rooms and cream-coloured walls with decorative finish visually expand the apartment space, filling it with light.